Help CentreUsing SuperControl Configuring my propertyHow do I set-up unique questions for my booking form? 1. Go to Properties > Booking and enquiry form fields. 2. Enter your Question label. This is the question you want to ask eg. How would you like your beds made up? Is your booking for a party, special event or gathering? 3. You can add "Help notes" incase you need to provide additional information as to why you are asking the question. 4. 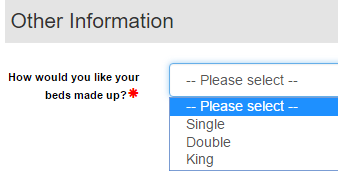 Select your Question type. Text field: Creates a single line text field that allows the guest to type in their answer. Text comment: Create a larger text box that allows the guest to type in their answer (better used if they have to provide lots of information). Tick box: Creates a simple tick box if your question is an opt-in, opt-out style question. Drop down: Creates a drop down of options for the guest to choose. If your question is a simple Yes|No, you can create this as a drop down option. Text comment only: If you don't want the guest to provide an answer but you just want to include some additional information on your booking form, then this will enter your text as a comment only. 5. If you have multiple questions you can list them in a particular order by entering an "Order on page" (1 will display at the top). 6. Select if the question should be a compulsory field for the (Guest) on the online booking form and/or compulsory when adding an (Admin) booking. 7. You can select whether the question should display on the online booking form, online enquiry form or both. Also if the question doesn't relate to all properties, you can specify certain ones by clicking "Limit to certain properties" (by default it will apply the question for all properties). 8. Select if the question should show on the owner summary (AGENCY only) and/or on the guests booking summary. 9. Select whether the question should display in the guest login. 10. Allow the guest to answer the question on the booking form, guest login or both. 11. If you have multiple websites or just one website, ensure you tick the site you want to show the question on so that it displays online and Save. Prev: How do I add property groups? Next: How do I add custom text above my monthly calendar?